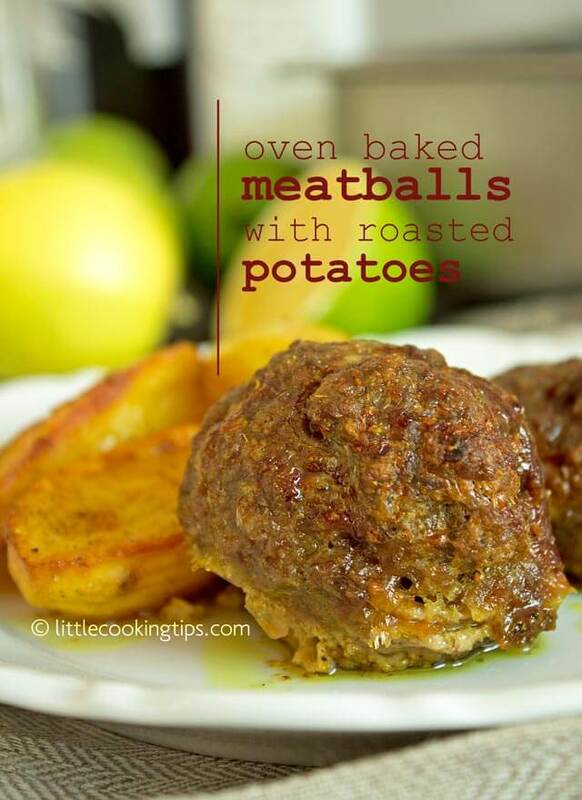 ﻿ Oven baked meatballs with roasted potatoes: a simple, delicious, aromatic recipe with olive oil and just a few spices! What a great season to get inspiration from! The fall is here, with all its beautiful colors. We are so glad that we’ll get to taste all the wonderful vegetables of the season, once again. An abundance of pumpkins and squash, carrots and cabbage, potatoes and beets, cauliflower and broccoli, lettuce and young onions. Fresh herbs like fennel and dill are back on the table, our pots and pans adding flavor and color. What a joy it is going for a walk in the fall. Exploring new places in the countryside is truly magical during this season. The explosion of colors in parks, gardens and groves is a feast for the senses. It regenerates and makes one happier, putting a smile on one’s face. Of course we couldn’t miss visiting again our family’s garden in Evia (also known as Euboea) island, to experience this wondrous transformation. Getting back in touch with our true roots; touching the soil and smelling the rain in the ground creates a feeling we wouldn’t trade for anything in the world. It was so wonderful to see the new plants in the garden. To see the new fruits ripening on the tree branches. To see the olives, ready to be harvested for the winter. As the nature is getting ready for the new winter season, it was time for us as well, to get back to blogging, after a few months’ absence. We missed all of you out there, and we missed sharing our passion for real, homemade cooking. One of the first recipes we’d love to show you is a rustic, delicious and easy Greek food which is perfect for any Sunday meal with your family. During the last season, we published a traditional recipe for Greek meatballs (keftedes or keftedakia), which are fried and usually served with French fries or Greek baked potatoes, a Horiatiki Greek salad and/or Tzatziki on the side. As it turned out, this worked really well for so many of our readers and soon became one of our most popular ground beef recipes in the blog. Taking this into account, we felt that we had to share another version of a Greek meatball recipe (keftedes), only this time they are baked in the oven with potatoes. The inspiration for the recipe came from a real life experience, a couple of winters ago. We have always loved the flavor and aroma of fenugreek. Fenugreek is a plant whose leaves and seeds are often encountered in the ingredients list of an Indian recipe. It’s also used to flavor cured meats like pasturma. Even though it contains the term “-greek” in its name, we didn’t find fenugreek in modern Greek recipes or meals our mothers cooked while we were growing up. Nor was it used in foods prepared in restaurants. Well, a couple of winters ago, Panos’ yiayia (grandma) Katina while sitting by the fireplace was sharing her memories of old recipes and ingredients she used to cook with, back in the 50s, when she was in her teens. Between others, she mentioned “tsimeni”, a word we once heard before. She started to describe how this spice was used in old recipes which she cooked back in the day and how it is still used today in…pasturma! Since we love pasturma, we looked up “tsimeni” as soon as we heard that. Apparently, tsimeni was a word for a paste whose main ingredient is fenugreek, also called trigonella in Greek (or moshositaro, meaning fragrant wheat!). Looking more into trigonella, we discovered that it was a plant used in Southeastern Europe for millennia. So there was something Greek in fenugreek after all! Unfortunately, perhaps because of its strong flavor and aroma, it was abandoned in the last decades, to the point that most Greeks (ourselves included) had no idea what it was. So, we had to experiment and try fenugreek in many Greek recipes. The end result was a variety of delicious dishes and marinades. For instance, try to add some fenugreek in a lemony chicken marinade, along with dry oregano. You’ll be surprised by the delicious result. Back to our homemade meatballs now; as mentioned, we wanted to share another easy meatball recipe (keftedes). One of our most successful uses of fenugreek is in keftedes. Just like with biftekia (Greek burgers) which are also baked in the oven, these Greek meatballs are a great idea for a Sunday lunch. This is a food that’s even better when shared with your family and friends. Our memories are filled with our parents hosting a Sunday lunch, with our cousins, aunts and uncles, under a gorgeous sun. Even on the coldest days of the fall, we are blessed with lots of sunshine here in Greece; and sharing a table with mezedes (appetizers), oven baked meatballs (or biftekia burgers) and good wine with your family, is truly warming for the soul. You probably have similar memories as well, having experienced magical moments like that. In this recipe, we baked the meatballs on a bed of potatoes. Those golden wedges are slowly roasted in olive oil, enhanced with the citrus flavor of the coriander, the spicy taste of the cumin and the mild ginger-like taste of the turmeric. If you’re reading this blog often, you are already familiar with our obsession for turmeric. Turmeric adds a wonderful color and enhances the taste of every food it's added to. If you don’t have any turmeric, you can also add a little mustard instead, for a different, but equally delicious result. The potatoes in this recipe are roasted until tender and soft in the inside and crispy on the outside. And their flavor is truly unique. Even if you don’t want to have meat, you can try and just bake the potatoes of this recipe. You can serve them then with feta and/or tzatziki, for a delicious vegetarian meal. Keftedes and potatoes are best served with a fresh salad on the side. We often serve this dish with a simple lettuce and vinaigrette salad, or coleslaw. It’s also great with a horiatiki Greek salad and tzatziki. If you want to serve something totally different and delicious, perhaps for Thanksgiving, this recipe is something you should probably look into; served with fragrant mashed carrots on the side, this is maybe one of the most delightful choices. Full of aroma, filling and rustic, these oven baked meatballs are among the best comfort foods you can try. Plus they’re very versatile, since you can add or substitute the spices according to your liking, and create countless variations of your own. The possibilities are endless. Another advantage of this recipe is that it’s a great make ahead recipe. You can easily prepare it a day before, allow it to cool to room temperature and then cover the pan with film and store it in the fridge. The next day, you simply remove the film, pop it in the oven for 15 minutes in 200C/390F and you’re ready to serve! Do not reheat in microwaves though; baked potatoes are tastier (and still crunchy on the outside) if you reheat them in a conventional oven. So let’s see how to make these beautiful oven baked meatballs! Cut the potatoes in half lengthwise (pic. 1), and do the same with the two halves (pic. 2). Then cut them horizontally to form wedges (pic. 3). Put the potatoes in a baking pan and add the olive oil (pic. 4) and the spices (turmeric, coriander, cumin, pepper, salt). Mix well/toss with your hands to coat the potatoes with the oil and the spices (pic. 5). Set aside. Remove the crust from the bread slices and cut into chunks (pic. 6). Dense, stale bread is far better for this step. Add the bread chunks into a food processor and pulse to create breadcrumbs (pic. 7). Sometimes (depending on the bread), you may need to shake the food processor a bit, to get the process started. At this point preheat the oven at 200 degrees Celsius/390 Fahrenheit. If using convection oven (fan baking) set at 180 degrees C / 370 F.
Arrange the meatballs on top of the potatoes and cover the pan with foil (be thorough). Bake in the middle oven rack for 1 hour. Then remove the foil, and keep baking for another 30 minutes (depending on how golden or brown you like the potatoes). 2. Feel free to try other types of ground meat as well, like lamb or turkey (or mixes of ground meat). This recipe is especially good if you’re looking to make turkey meatballs. 3. If you cook for more than four, make sure to double (or triple) the ingredients, as this recipe is just for four portions. 4. If you prepare this meal a day ahead, store in the fridge (covered with film) and reheat in a conventional oven for 15 minutes (at 200C/390F) the next day.